That's a very long name, but at least we know what it does. We add/update a comment: "Thrown 3 times, last one was 14/07/2016 09:37:47"
Generate a GitLab API token. Navigate to https://gitlab.com/profile (replace the URL with your instance's if necessary, but don't miss the /profile part), then "Personal Access Tokens". You can name it whatever you want, but "SymfonyExceptions2GitLabIssuesBundle" seems to be a great name. Note: you can share this token between several projects. Note: if you're using https://gitlab.com, you can actually skip the gitlab_api_url. If not, don't forget the /api/v3/ part. Deploy your app in production, and trigger an exception. An issue should be waiting for you in your GitLab repository. (optional) Customize the excluded_exceptions node to include/exclude exceptions from being handled by this bundle. By default (if the excluded_exceptions isn't specified), all exceptions are handled. Here are some more things you can configure. Just add these items to your config.yml, under the sym_exc_2_gtlb_isu_bndle node. When set to true, any closed issue will be reopened when a matching exception is caught. When encountering an exception in one of these environments, we won't report anything to your GitLab repository. Tip: include back the dev environment (excluded_environments: ) to test this bundle without deploying to prod! Array of FQCN (fully qualified class name) of exceptions to ignore. 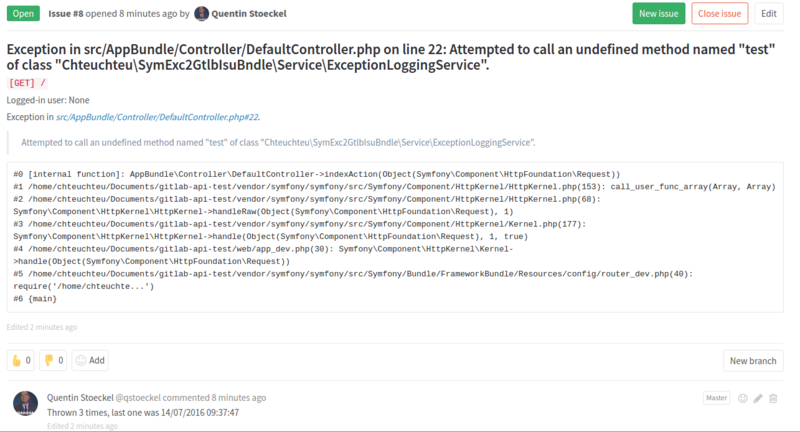 Tip: add Symfony\Component\HttpKernel\Exception\NotFoundHttpException to ignore 404 exceptions. GitLab users to be mentioned in the issue body. Example: ['user1', 'user2', 'user3'] will append "Mentions: @user1 @user2 @user3" at the end of the message.